Little Friends' Inklude Studio to Display Original Artwork — Little Friends, Inc.
Naperville, Illinois – September 18, 2018 - Little Friends’ Inklude Studio is thrilled to present a public art exhibit in Wheaton, titled The Inklude Collection 2018 this Fall at the DuPage Art League. More than 40 original works, across numerous mediums, will be displayed. More than 15 clients from Little Friends’ Inklude Studio, have submitted materials. “This is an incredible opportunity for our artists. Art gives voice to those thoughts and feelings that cannot be expressed in words. It is empowering. And to have artwork exhibited for all to see and appreciate is a tremendous way to add value to a life,” says Nikki Bozzano, Inklude Studio Manager. Little Friends artists have been working through the creative process for several months—forming an idea, choosing a medium, creating the work, and submitting pieces for display. All artwork will be on display at the DuPage Art League Gallery 2 (218 W. Front Street, Wheaton) from September 29th until October 19th. An artists’ reception will be held in the gallery on Sunday, October 7th from 2:00 p.m. until 4:00 p.m. “I am so proud to be part of this exhibition. To present clients’ art with honor in a public gallery setting, not only gives value to their work, and, in turn, the artists themselves, but also provides an avenue for giving a voice to many who cannot do so with words. The exhibition allows us to raise awareness of Autism Spectrum Disorders, and hopefully encourages a greater understanding and appreciation for our clients’ challenges and their triumphs,” states Bozzano. 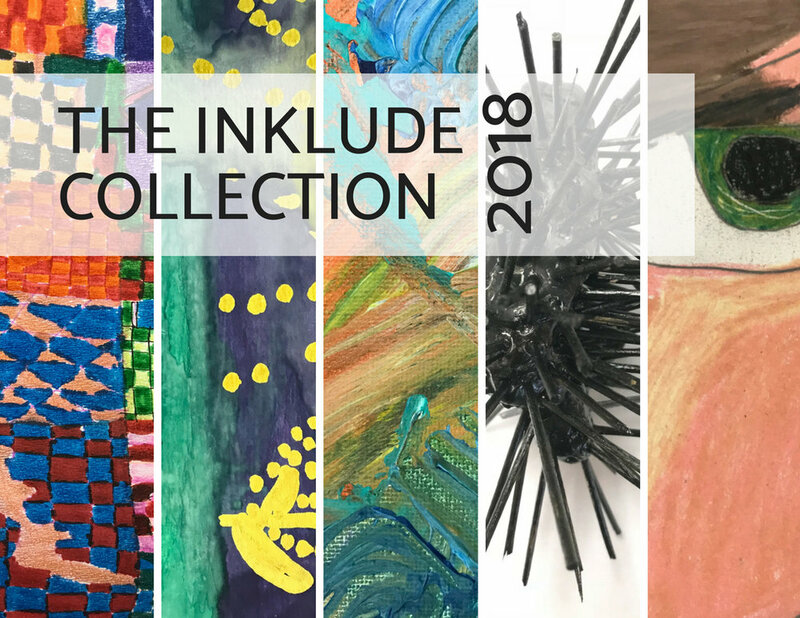 The Inklude Collection 2018 is made possible, in part, by a generous gift from the JCS Fund of the DuPage Community Foundation.